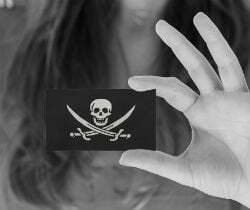 A federal court in Florida has granted a temporary restraining order against 33 relatively small pirate sites. The order, requested by media conglomerate ABS-CBN, targets the sites' domain names, advertising revenue, as well as any associated PayPal and other bank accounts. ABS-CBN, the largest media and entertainment company in the Philippines, is continuing its legal campaign against pirate sites in the US. We previously covered how ABS-CBN managed to get court orders to seize domain names, without the defendants getting actively involved. In another case, it expanded on this strategy by also going after advertising revenue. This is also the case in a recent lawsuit, where a Florida federal court signed a temporary restraining order targeting more than two dozen sites. However, ABS-CBN takes it up another notch, going after the bank accounts of the sites involved. Last week Chief United States District Judge Kevin Michael Moore signed a temporary restraining order directed at 33 pirate sites. The targets are predominantly niche streaming sites specializing in Pinoy content, such as pinoy.live and pinoybay.se. While these sites serve a relatively small audience, the restraining order has broad implications. It orders domain registrars and registries to make the sites unavailable, for example. In addition, advertising networks are compelled to stop doing business with the sites and freeze any outstanding funds. Finally, and that’s new, the restraining order also targets payment processors. 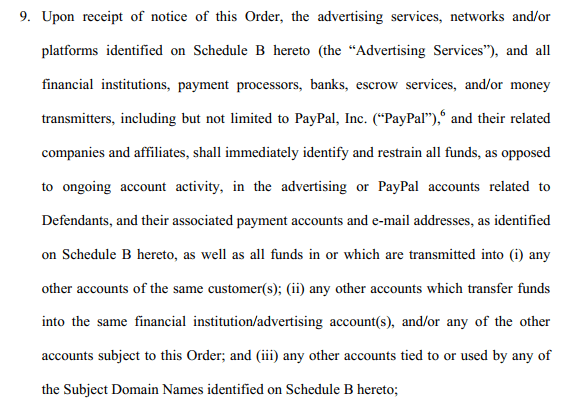 The court specifically mentions PayPal, but the order applies to other payment processors, banks, escrow services, and/or money transmitters as well. The advertising companies, including Google’s Adsense, and the other companies such as PayPal also have to provide a detailed overview of the funds they hold for each of the respective sites. 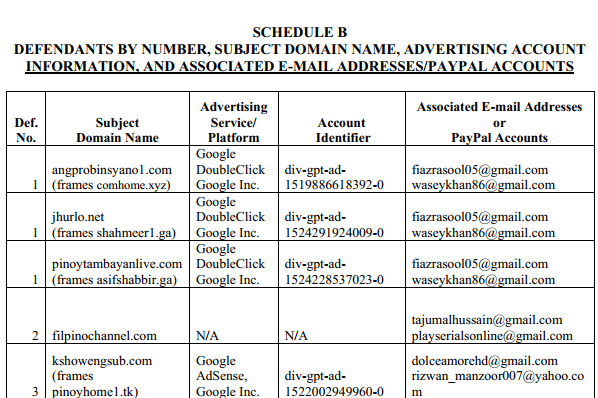 Interestingly, the PayPal addresses were discovered through data provided by Cloudflare in response to a subpoena. The details of the relevant order are, unfortunately, being kept under seal. It’s clear, however, that the media giant is using all the legal tools at its disposal to target these pirate sites. The restraining order (pdf) will remain in effect until the court rules on ABS-CBN’s motion for a preliminary injunction. Based on previous cases it’s likely that the measures will remain in effect. At the time of writing, most of the targeted sites are still available, either on their original domain names or through a backup location.